April 2nd of this year the world’s fastest Grandpa Jerry Hopp set his 3rd major speed record driving Hopp Racing’s APBA Grand Prix Hydroplane. Jerry averaged 170.620 mph in the flying 1/4 mile straightaway at Oroville, CA. Jerry also hold the 1 2/3 mile circle track record set last summer at 110.081 mph and the Kilo straightaway record at 169.081 mph. Jerry now has a “Hat Trick” of boat racing holding 3 of the 5 APBA speed records in Grand Prix Hydroplanes. 70 year old Jerry gave a BIG Thumbs up to ARP for supplying the outstanding hardware that holds the Hopp Racing big block Chevy together. The 468 ci supercharged alcohol engine puts out 1500 HP and the engine is run at 8500 rpm. Hopp Racing uses the same engine for straightaway and circle track racing. Now the circle track season has started with upcoming races at Tri-Cities and Seattle Seafair in Washington state. The “World’s Fastest Grandpa” APBA Grand Prix driver Jerry Hopp wins the Soap Lake Regatta. Driving Hopp Racing’s Happy Go Lucky Jerry’s consistency paid off. Jerry finished all 4 heat for the weekend winning the event and put Happy Go Lucky in an early lead in the GP points race. Jerry holds the APBA-GP Kilo record at 169.081mph. Jerry would like to thank his sponsors this year for their excellent products that help keep Hopp Racing in the winners circle. ARP, Ed’s Automotive, Kendall Oil, Lunati, PumpTech, Silver Lake Dental Arts, Taylor Cable and Wired Energy Drink. Hopp Racing–Fastest APBA Grand Prix Hydroplane on Earth! 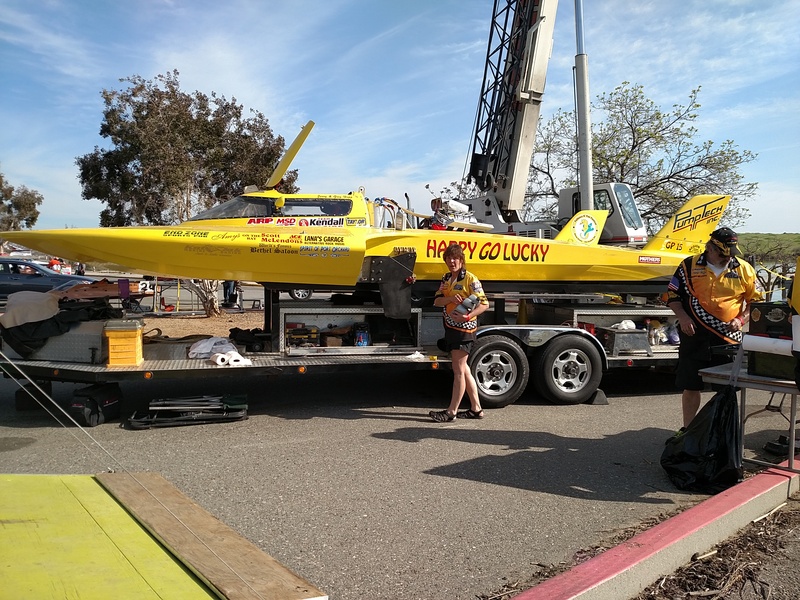 The Hopp Racing GP-15 Grand Prix Hydroplane, affectionately known nation wide as “The Yellow Rocket” had an exciting year in 2011. Starting with a big win at Tastin’ n Racin’ in front of 60,000 fans on Lake Sammamish (15 minutes from downtown Seattle) and ending with a brand new APBA Grand Prix Kilometer speed record o…f 169.081 miles per hour. Jerry Hopp did the driving. He broke his son Greg’s record set the year before. This happened in Lincoln City Oregon, just 1/4 mile from the Pacific Ocean. Next year features a larger schedule, and more boats. The competition will be bigger and better. It was a very good year. We are proud to say the GP-15 IS the fastest APBA Grand Prix Hydroplane on planet earth!! Bob Wright with Hopp Racing in Snohomish Washington. We continue to use ARP products, and we continue to win!!! Hopp Racing had another exciting year in 2009. Greg Hopp set an automotive powered speed record in Evansville Indiana with a 132.846 mph on the 2 mile Unlimited Hydroplane course. In doing so, he qualified faster than 2 of the turbine powered unlimiteds. Greg would go on to win the region 10 Grand Prix title again. Hopp racing did so by getting wins at Mose Lake, and Tastin’ n Racin’. We finished the season by bringing home the UIM World Championship trophy from Morgan City Louisiana. This year with the backing of Fleury’s auto and truck parts, Pumptech, Happy go Lucky, and ARP we started the 2010 campaign with a win at Moses Lake, and the National High Points lead. The next event is Tastin’ n Racin’. Over 60,000 fans are expected, just 20 minutes from downtown Seattle. As defending champion everyone is “gunning” for us. We are ready for the challenge!! !